This u pdate brings together key findings from recent original studies on constraints and solutions to women’s economic empowerment (WEE), as well as the social and economic benefits of WEE. For key findings and quick links to sub-sections please refer to the Contents section below. To view this Update as a pdf file, click here. 1. Recent analyses show persistent gender gaps in the economic empowerment of women and men in the agricultural sector, across different countries. 2. Economic transformation offers new opportunities for entrepreneurship and wage labour as well as social empowerment; however, women often seem to benefit less from these economic opportunities than men. 3. Recent research on WEE in the agricultural sector points to a number of country-specific policy solutions and approaches that can be supported by donors, often focused on addressing the most binding constraints, or enhancing women’s participation in markets that they are already active in. 4. Some studies on regulatory reforms and agricultural value chain interventions focus on their social empowerment benefits, in particular women’s agency. These benefits often seem to increase over time. 5. Some studies however also show that many economic development programmes have not been effective in addressing binding constraints for women (see for example also Berge et al. (2012)). 6. There are also ongoing discussions on whether or not WEE may lead to increased partner violence. While the research is inconclusive on this, programmes can probably do more to reduce the risk of doing harm. A study of the gender gap in agricultural productivity in Malawi (Journal of Development Studies, 2015) shows significant differences in labour and land productivity between men and women. Agricultural labour productivity is, on average, 44% lower on female-headed plots than on those managed by male heads. This gap is mainly explained by differences in access to farm labour (34%) and in access to credit (29%). The gender gap in land productivity is estimated at 24%; this is mainly explained by a lack of inputs such as seeds and fertiliser (52%) and household endowments (36%), both of which can be considered as a function of women’s higher liquidity constraints and lower access to off-farm wage labour. The World Bank (2015) provides a more extensive assessment of the gender gap in agricultural productivity in Malawi as well as Tanzania and Uganda. According to this study, the total agricultural productivity gap between women and men ranges from 4 to 25 %, depending on the country and crop. The cost of this gender gap is estimated to be $100 million in Malawi, $105 million in Tanzania, and $67 million in Uganda per year. One root cause is unequal access to agricultural inputs such as land, labour, machinery, knowledge, fertiliser and improved seeds. Women are also less likely than men to engage in export crops. Addressing the gender gap could increase crop output by 2.1 % in Tanzania, 2.8 % in Uganda, and 7.3 % in Malawi, and lift between 80,000 and 238,000 people out of poverty in the three countries. Quaye et al. 2015 also highlight access to, and control over, land and other resources as a key constraint for WEE: In Ghana, men have up to 80% more land access and crop acreage than women. The study also finds a low level of female participation in decision-making over productive assets. women also have less access than men to higher-skilled or public-sector jobs, and business associations. 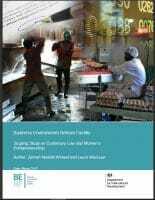 An analysis of the role of manufacturing growth on the lives of Bangladeshi women (Journal of Development Economics, 2015) however also points to the absolute social and economic gains that manufacturing growth may offer to women: It finds that women living closer to ready-made garment factories are more likely to be employed outside their homes, and to be enrolled in school after garment industries, which reward literacy and numeracy, arrive in nearby areas. The demand for education generated through manufacturing growth appears to have a larger effect on female educational attainment than a large-scale government conditional cash transfer program to encourage female schooling. Majilesi (2016) finds that an increase in the relative number of jobs available for women in the Mexican manufacturing sector positively affects women’s bargaining power within household. As the relative demand for female labour goes up, women gain power over decisions regarding major household expenditures, their own private goods and their work status, among other things. This effect is not limited to working women. Larger companies can make significant contributions to reducing the gender gap through access to jobs with decent wages, or by creating enabling conditions for reduced gender-based violence – but they are often not willing to do so because of perceived costs, risks, or lack of awareness. The IFC has now compiled a report on the business case for investing in women (2017), which donor programmes can draw on in advising partner companies. Based on quantitative evidence and case studies, the report demonstrates that there are clear commercial benefits to be gained through reducing the gender gap. The World Bank (2015) highlights the value in identifying the most important productivity constraints in a country in order to devise policies that can deliver the best value for money. Suitable interventions might include making existing policies more gender-sensitive, and/ or targeting specifically women, for example by promoting access to productivity-enhancing technologies. The report includes a summary table of different policy options for enhancing women’s agricultural productivity and their relevance for GDP gains in Tanzania, Malawi and Uganda. For Tanzania and Malawi, the study specifically identifies women’s access to male labour as a key constraint; if improved, it could yield gross gains of over $45 million in Malawi and over $100 million in Tanzania. In Uganda, one priority is to improve women’s access to agricultural machinery and other production technologies, which has the potential to increase GDP by over $11 million. A study of land certification in Ethiopia (Bezabih et al., 2016) finds that land certification has a positive effect on productivity across households, and is particularly strong for female-headed households. Households, including women-led ones, also become more likely to rent out land after certification. The study also references earlier analyses of the certification programme which found positive impacts on women’s participation in the land rental market as well as on food security in female-headed households. While cash crops offer higher selling prices, they are also often associated with higher entry barriers for women. Handschuch and Wollni (2016) find that even when focusing on traditional food crops with lower entry barriers, women can secure higher incomes by working together in farmer groups: In analysing the finger millet value chain in Kenya, the authors find that female sellers are not excluded from millet markets, but tend to receive lower selling prices than male sellers – unless they participate in finger millet groups. While participation in millet groups is positively associated with higher selling prices for female sellers, it does not have a significant influence on the selling prices obtained by male sellers. This is probably because traditional female gender roles are associated with a weaker position in market transactions, while producer groups can help women to enhance their bargaining power. Ngigi et al. (2017) studied gender differences in climate adaptation strategies in Kenya. They similarly emphasize the importance of understanding men’s and women’s roles and responsibilities and devising tailored policy responses on that basis: They find that a higher percentage of women adopt crop-related adaptation strategies, whereas husbands focus on livestock- and agroforestry-related strategies. They not only have different information needs but also use different channels of information (e.g. extension officers and local leader meetings are used more by men and radio programmes or group meetings are used more by women). Climate change adaptation programmes in agriculture are therefore likely to be more effective when using gender-sensitive approaches, in contrast to interventions working with mixed groups. A new literature review on the role of customary law for women’s entrepreneurship (Business Environment Reform Facility (BERF)/ DFID, 2017) assesses how customary laws and practices influence the formal components of the business environment. It finds that the components most affected include access to finance, business registration and licensing, land titling, and access to commercial courts and dispute resolution mechanisms. The report recommends that more attention should be paid to customary laws and practices when designing business environment reform (BER) programmes. Gender-Sensitive BER and Informality (2017). 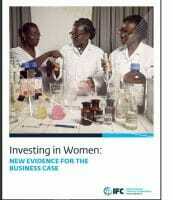 A literature review on ‘Enhancing the productivity of women-owned enterprises: The evidence on what works (2016)’ provides a useful summary of constraints and solutions across different types of interventions, including training and finance, value chain approaches, legal reform, trade and procurement policies. A shorter policy brief (IDRC, 2017) based on the review is available here. An empirical analysis of the impact of women’s land ownership in Nepal (World Development, 2016) finds that women who own land have greater household decision-making power in areas of own healthcare, major household purchases, and visits to family or relatives. Similarly, Melesse et al (2017) find that the Ethiopia joint land certification programme had positive impacts on women’s agency: Specifically, women owning certified land are more likely to participate in household decisions and community activities, be aware of their land rights and land related provisions, have a higher perceived level of tenure security, and are more willing to protect their land rights. The authors also document positive impacts in terms of the freedom of physical mobility, autonomy, and institutional inclusion. Productive asset transfers and increased income-generating opportunities for women also seem to have an impact on gender norms in Burkina Faso (2015). Specifically, the programme included a small transfer of agricultural and animal assets, training in optimal agriculture and animal raising practices and optimal health and nutrition practices. Over time, women in programme areas gained greater decision-making power and control over home gardens and their produce, and attitudes towards women owning property have become more favourable, even if men still controlled most assets. Chiputwa and Qaim (2016) also find a positive impact of sustainability standards in coffee production (UTZ, and organic or fairtrade certification) on women’s empowerment in Uganda: When a household is certified, the probability that a man alone controls coffee revenues is reduced by 66%. The authors provide two reasons for this: First, some of the sustainability standards promote gender equity through special training and awareness-building. Second, certified coffee production with stricter standards increases the demand for labour, so that female household members become increasingly involved in the coffee crop. More female labour spent on coffee production seems to improve women’s bargaining power and their influence on decision-making. Behavioural changes conducive to empowerment also increase over time: The longer households have been certified, the less likely it is that men alone control coffee production and revenues. Each extra year that a household is certified increases per capita expenses by about 15 USD cents per day and reduces the probability of male revenue control by 9%. A new study (ILO, 2017) suggests that a key reason why programmes may be ineffective is that social norms prevent women from realising benefits from conventional interventions. The study investigated whether expanding access to capital via grants or loans would increase the profits of microenterprises owned by men or women in Uganda, and whether entrepreneurship training had any additional impact. It showed that men benefit from the package of microloans and training (but not from loans only, grants only or grants and training), leading to a 54 % increase in profits and similar effects on employment. However, women realize no impacts, whether they received loans, grants, training, or any combination of them. These results apparently relate to control in the household. When women are willing to ‘hide’ money from their husbands, they are able to keep control of it and use it for business growth. The authors argue that programs should include complementary support to guard business income from family pressure, such as private bank accounts. Finally, in addition to profit maximization, programmes could also consider other success metrics, such as women’s investments into the household’s needs, which may be more achievable in the near term. Overall, research findings suggest that the risk of increased partner violence as a result of women’s increased access to economic resources is highly context-specific. For example, Vyas et al. (2015) find that earning income or owning a business on their own, increased women’s exposure to partner violence in Dar es Salaam, but not in another Tanzanian town. Green et al. (2016) investigate whether partner participation in a programme that successfully increased micro-enterprise incomes influences the risk of violence in Uganda; while it does not seem to affect marital abuse or attitudes towards gender norms, the authors observe large increases in the quality of relationships. In a separate experiment (without active partner involvement) the authors also find that the initial quality of relationships influences the degree to which programme participants are able to increase their monthly incomes 16 months after the intervention. This aligns with ILO’s finding above that social norms in the household influence programme effectiveness. Note that USAID has published a brief on ‘Engaging and working with men: Program insights and key considerations for the agricultural sector’ (2016). The BEAM Exchange has published a blog that reflects on how programmes can understand better whether programme activities may affect or be affected by violence against women, and design programmes accordingly. The DCED has published a Synthesis Document (2017) that draws together resources and guidance on integrating gender and WEE into project cycle of PSD programmes – from assessment and programme design, to implementation and results monitoring. This guidance is based on the practical experience of economic growth programmes integrating WEE. The document is structured according to the elements of the DCED Standard. A DCED report on Business Environment Reform and Gender (2016) reviews the literature of WEE-related BER constraints and provides practical lessons on how to integrate gender considerations at each step of the project cycle of BER programmes. It is complemented by a policy guide on Why gender-sensitive BER matters (2017) and Donor Guidance on implementing gender-sensitive BER (2016). Oxfam (2017) has published specific guidance on defining appropriate indicators and constructing a WEE index. It takes into account changes at the personal, relational and environmental level. Note: For those interested in pursuing new research into WEE, the GrOW Research Series has launched a call for working papers on women’s economic empowerment and economic growth in low-income countries. This series is housed at the Institute for the Study of International Development (ISID) at McGill University. Findings of programmes and researchers have also been shared at the May 2017 SEEP Learning Forum on Women’s Economic Empowerment; many presentations and additional resources are available on the SEEP website. DCED Research and Evidence updates focus on journal articles and studies that offer credible findings on the effectiveness of private sector development (PSD) or research on economic development more broadly. This update has been compiled by Melina Heinrich-Fernandes of the DCED Secretariat. Click here to subscribe to future issues, as well as our separate Newsletters on the latest developments in PSD.